It is easy to see why Edinburgh is the United Kingdom’s second most visited destination with over a million tourists a year. From its almost constant festival scene (including the world famous ‘Edinburgh Comedy Festival’) to its Hogmanay Street Party and the celebrations on Burns Night, there are many events that might bring you to Edinburgh. Whether you live in Edinburgh and are looking for coach hire, or you are organising a group trip or holiday to visit this exciting city, National Coach Hire can offer a relaxing, inexpensive and flexible service. 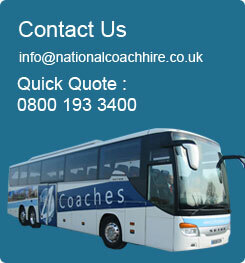 We have access to the very best coach operators both in Edinburgh and all over the UK. National Coach Hire know Edinburgh inside out and we can make sure you get the most from your Edinburgh visit, taking in all of the city’s sights by coach. Whether you’re heading there from England, or from somewhere else in Scotland, coach hire helps you see not only the best of Edinburgh, but also the incredible scenery en route. And once you’re there, Edinburgh itself really is a stunning city. With the Old Town and New Town districts now listed as UNESCO World Heritage sights; with its bohemian nightlife set within hundreds of 15th century buildings; with gorgeous brooding churches and a charming and hilarious bunch of locals, Edinburgh really does have something for everyone. If you’re there for the history, then we’ll take you around by coach to visit all the sights, from Canongate Kirk and Greyfriars Kirk and Kirkyard (where the National Covenant was signed); to Holyrood Abbey and the dark black crags of Edinburgh Castle towering above the city; from the splendid Parliament House to the poignant Greyfriars Bobby there is history aplenty and, simultaneously, the buildings to go with it. In terms of architecture, Edinburgh is special, from the castles and the battlements to the old houses, to Charlotte Square to the City Chambers, (both designed by John Adam). It is also one of the best places in Britain for art and the arts, with five national galleries, from The National Gallery of Scotland to the Dean Gallery to the City Art Centre and the Scottish National Portrait Gallery and the Scottish National Gallery of Modern Art with a stunning collection ranging from Magritte and Picasso to Matisse and Mondrian. With hundreds of other stunning museums and exhibitions, Edinburgh has too much to offer, so allow National Coach Hire to take you around the best bits! And if you are using Edinburgh as a base to explore the surrounding areas and the rest of Scotland, then coach hire really is the best option. From day trips to Holyrood Park and Duddingston Village in Edinburgh, to sailing in the Firth of Forth, coach hire can show you around the stunning outskirts of Edinburgh. And of course, should you wish to go further, there is the Border Region, the Forth Bridge, the Pentland Hills and the equally fascinating city of Glasgow. Perhaps you might wish to head up to St Andrews and visit the holy ground of golf, or across to Stirling Castle, for so long a centre point of Scottish History. Wherever you want to go, you can be sure the Scottish landscape will be incredible, and that travelling by coach is the only way to truly appreciate it.